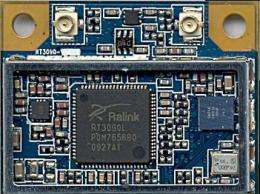 Ralink Technology, a developer of high performance wired and wireless networking solutions, today announced the RT3592BC8, the world's only chipset capable of simultaneous 300 Mbps 2x2 MIMO dual band 802.11n and Bluetooth 3.0+HS operation. The half MiniCard solution for PCs, notebooks, netbooks and connected mobile devices delivers an unprecedented level of performance and intelligent coexistence between Wi-Fi and Bluetooth. With support for concurrent operation of dual-band 802.11n Wi-Fi and Bluetooth’s highest performance modes, the RT3592BC8 elevates wireless mobile computing into a new level of multimedia capability. Peer-to-peer gaming, shared and tethered connections can now be initiated via the simplicity of Bluetooth 3.0+HS detection and setup while 2x2 MIMO 802.11n dual-band Wi-Fi boosts data rates to 300Mpbs. Able to function in both 2.4GHz and 5GHz, the RT3592BC8 eliminates interference by allowing Wi-Fi and Bluetooth components to coexist in the same band or to function in separate frequency bands. In addition to dual frequency band operation, the RT3592BC8 combo solution ensures optimal radio coexistence between WLAN and Bluetooth with a sophisticated coexistence algorithm for improved harmony between co-located WLAN and Bluetooth radios. It dynamically adjusts WLAN and Bluetooth transmission parameters to reduce interference, maximize performance, and automatically adjust to the presence and operating characteristics of nearby Wi-Fi networks. The result is a solution that delivers up to 80 percent faster WLAN throughput compared to other vendors’ WLAN plus Bluetooth combo solutions. Leveraging its single-chip 2x2 dual-band 802.11n architecture, Ralink has further integrated 14 components, saving additional cost and delivering better performance compared to discrete Wi-Fi and Bluetooth solutions. The optimized bill of material, simplified design, and integrated manufacturing and testing procedures enables Ralink customers to deliver cost-effective yet high-performance solutions in an easy-to-integrate standard half MiniCard form factor.